Photo of a blue pheasant by Bob Mac Innes via Flickr/Creative Commons. Neighbor Beth reported a found bird to the Beacon Hill mailing list yesterday. The bird turned out to be a male blue pheasant, but unfortunately, went away before Beth could return with chicken feed for it. 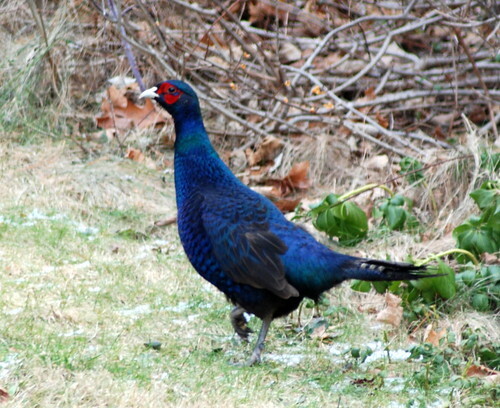 Have you seen a blue pheasant like the one pictured here around North Beacon lately? I was a sign posted for a lost bird yesterday at the corner of 12th and S. Atlantic or Massachusetts I believe….didn’t notice what kind of bird was missing though. I’ll see if the sign is still up later today. I saw a sign posted for a lost bird yesterday at the corner of 12th and S. Atlantic or Massachusetts I believe….didn’t notice what kind of bird was missing though. I’ll see if the sign is still up later today.